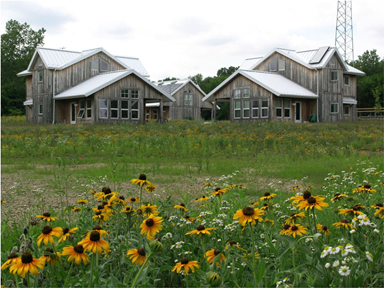 Rieth Village is an ecological field station for undergraduate programs. Two cottages provide housing for up to 32 students, and a third cottage serves as the initial classroom and office building. Rieth Village has been designed and constructed with a strong commitment to sustainability. The project was awarded the platinum LEED certification (55 points) from the U. S. Green Building Council in 2007. It is best to schedule a tour if you are interested in interacting on details with a Merry Lea staff person. Group tours cover various aspects of sustainability and green design. With advance notice, we can offer both preK-12 field trips and adult programs.